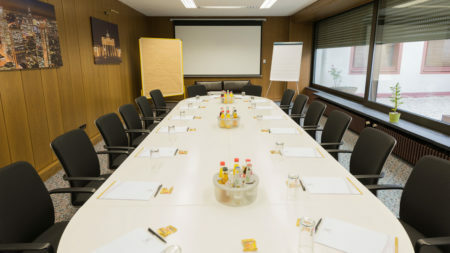 Our TRIP INN conference hotel Frankfurt Höchst is located in the beautiful district Hoechst in the western area of Frankfurt. 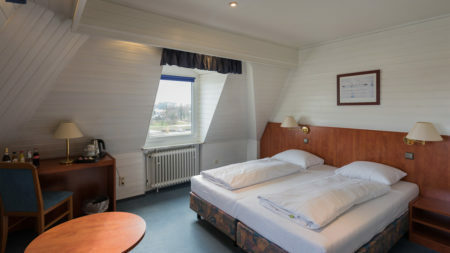 The hotel guests are immediately charmed by the fantastic view to the river Main in only a few meters distance. The ancient town of Hoechst is only a few walking minutes away and offers a good variety of shops, restaurants and bars. 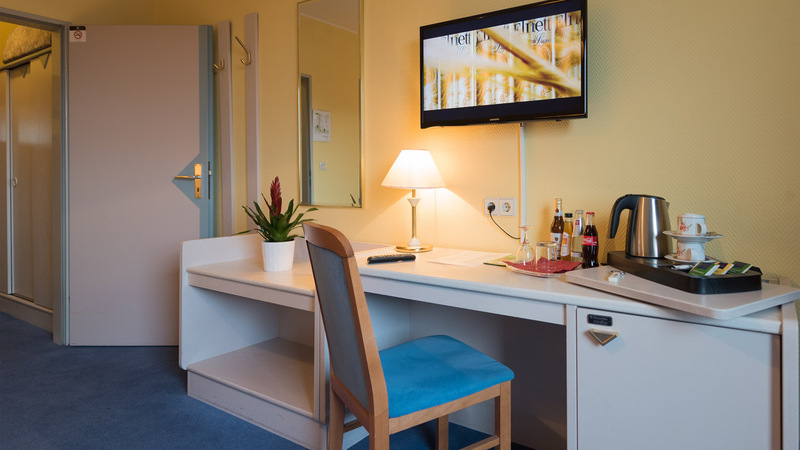 Our guests can take advantage of many included services, such as free WIFI, breakfast, newspapers or bike rental. 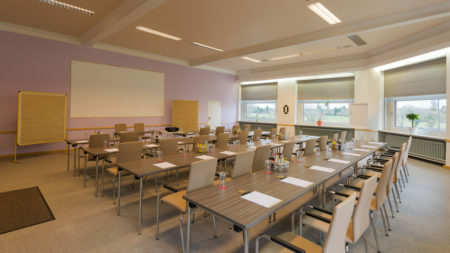 Frankfurt Airport, Central Station, Frankfurt Messe and downtown Frankfurt can also be acchieved in a few minutes by car, taxi or public transport. 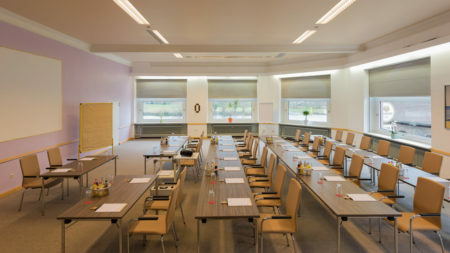 Conference Hotel (Tagungshotel) Frankfurt Hoechst provides 135 individually furnished non-smoker rooms. Each of them is either equipped with a bathtub or a shower. 85 are single bed rooms. 50 double bed rooms, which partly can be used as 3-bed or 4-bed rooms. Some of our rooms offer a fantastic view to the Main river, others are oriented towards the courtyard or a quiet side road. All of our rooms are comfortably equipped with television, telephone, minibar, make-up mirror, and free wireless internet. Hence, our hotel ideally fits business traveller’s needs. The exceptional location at the river Main does not only offer the opportunity for business people to recover from job-related stress, but also for tourists to have a relaxing wlak along the riverside. Sports enthusiasts may also start a bike tour or go running along the beautiful Main river. Newly in love or peace seeker? 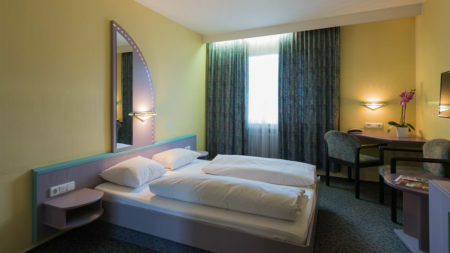 In our four-poster bed room you will exactly what you are looking for. 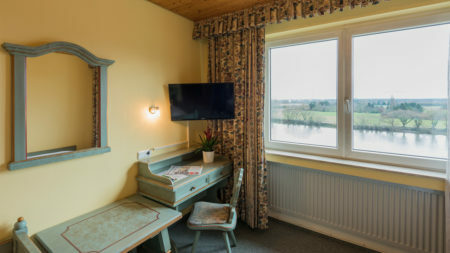 The decorative wooden furniture and the cosy bay window with river view invites to a longer stay in this extraordinary room. 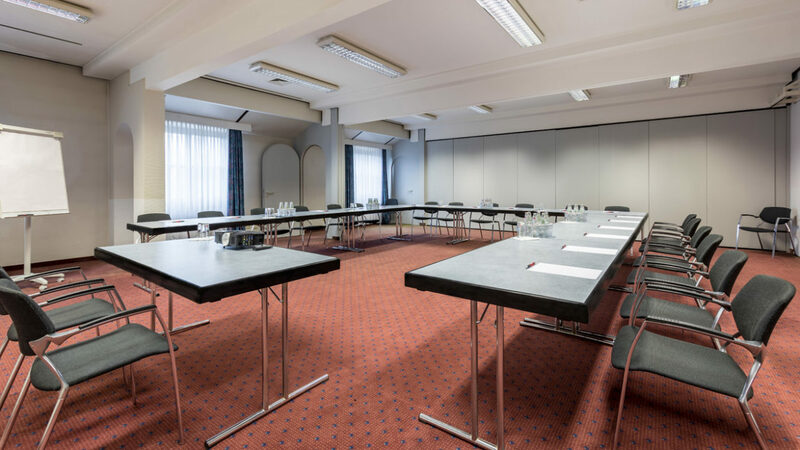 Beautifully located directly at the river Main, the Conference Hotel Hoechster Hof warmly welcomes its guests! 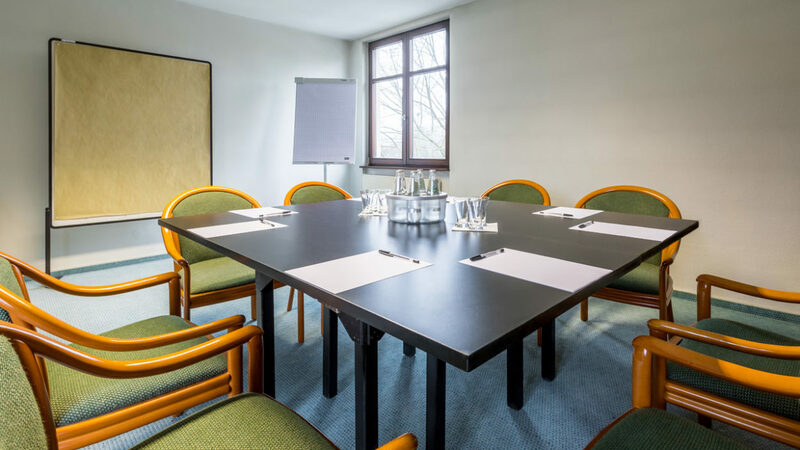 Whether you plan a conference, business meeting, or a workshop – with its up-to-date equipped conference rooms our hotel offers you the optimal spaces for your business occasion. 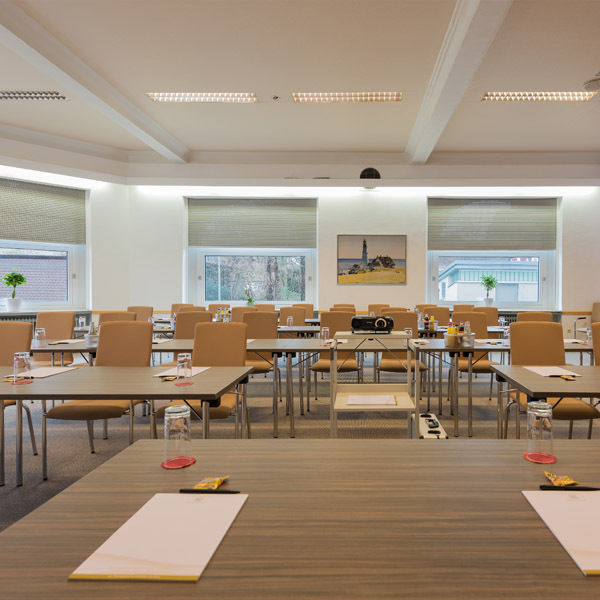 We can offer five flexible rooms to you with a total capacity of 300 persons. 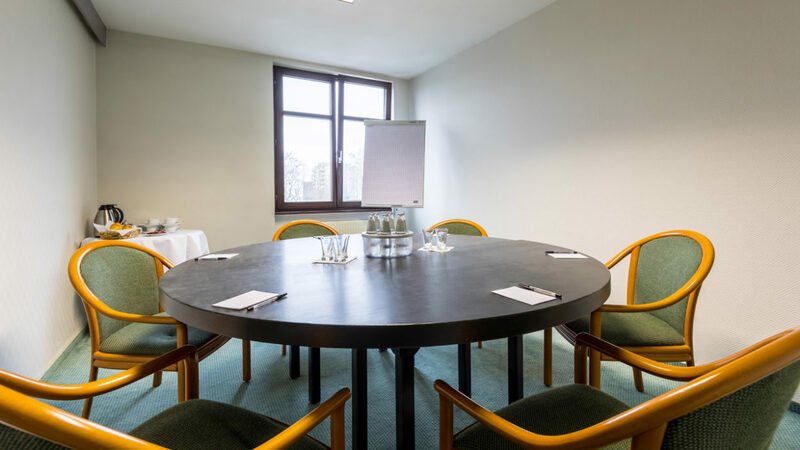 Our biggest conference room has a floor space of 156 sqm and a picturesque view to the Main river. 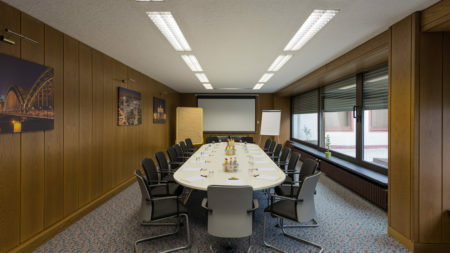 All conference rooms are equipped with modern technique, including a projector as standard. 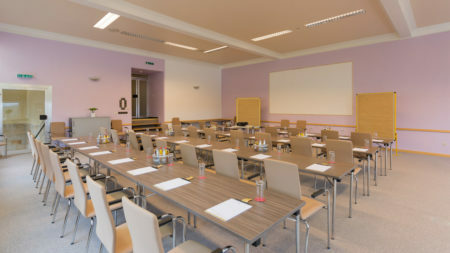 Flexible seating options, optional darkening possibilities and a free choice of the table layout enable you to design the room according to your events needs. 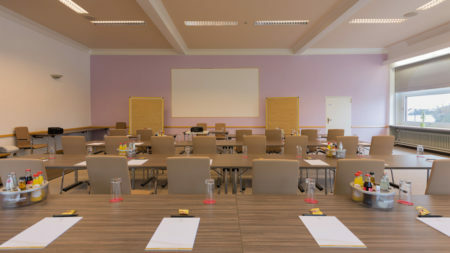 Don’t miss to ask us for our diverse and very attractive conference flat rate for seminar weekends and conferences. 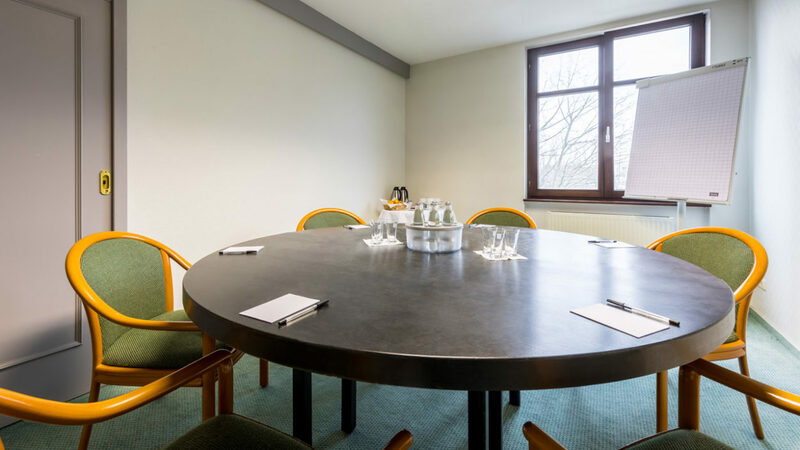 Parking your car at the hotel is not a problem at all: there is a fee-based car park directly at the hotel and additionally a spacious car park directly at the riverbank, only five walking minutes from our hotel. 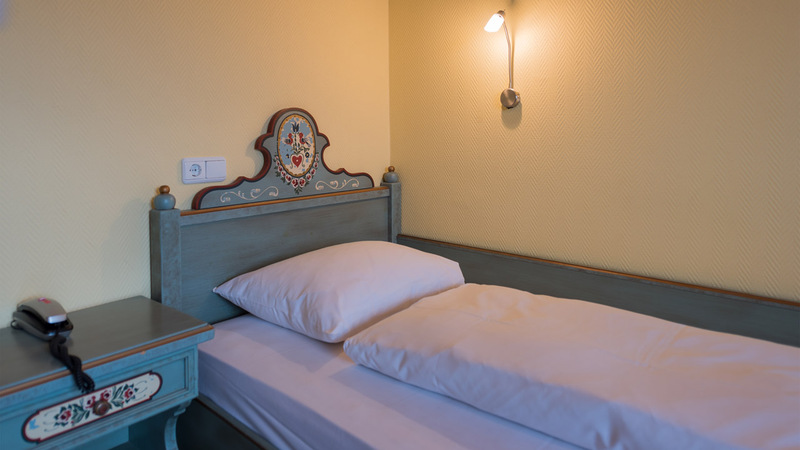 From Tagungshotel Hoechster Hof you can also easily achieve the beautiful ancient town of Hoechst by foot. Main sights here are the castle, the Justinus church and the procellain manufacture. 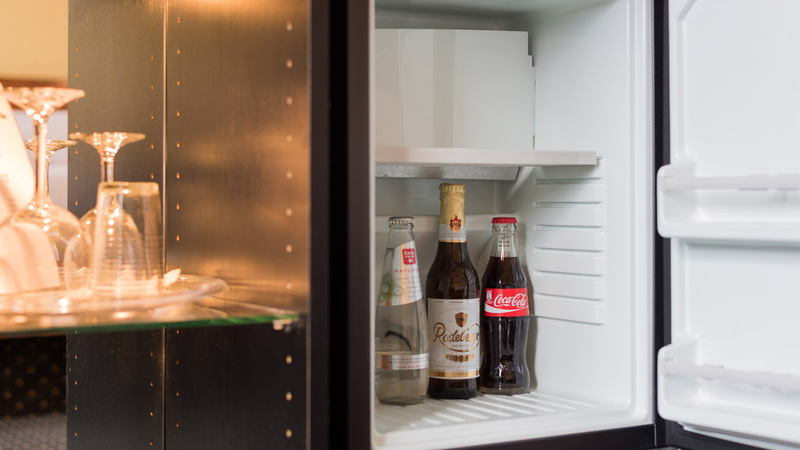 You are travelling to Frankfurt, be it for business or private reasons, and you fancy a snack, a cool drink or coffee? 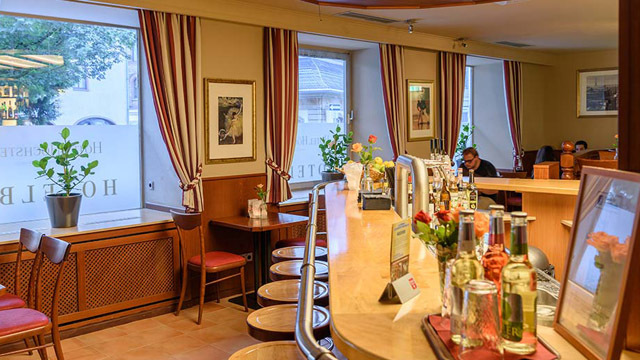 Then you should check in at our hotel Höchster Hof and visit our restaurant „Café Restaurant, Bar“, which opened at June 1st, 2017. Just a few steps away from the beautiful Main riverside. 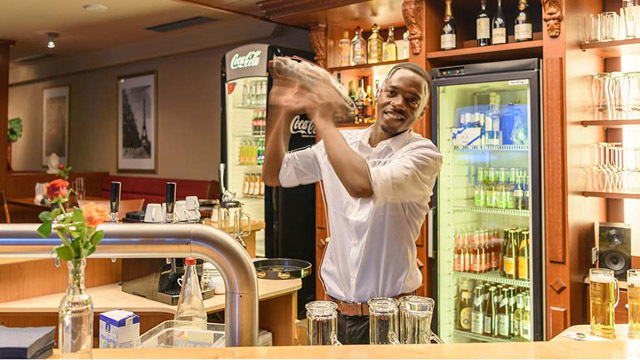 You won’t be disappointed by the the quality of the meals, the selection of drinks, the cosy atmosphere and the kindness of our staff. Your satisfaction is our main goal. Our opening hours are Monday to Friday from 5 to 11 pm, warm kitchen is available until 10 pm. 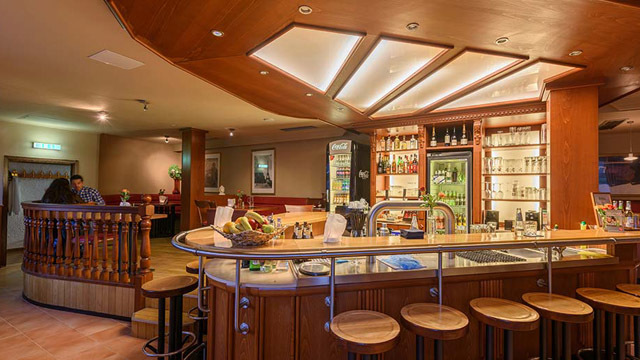 On special request for provate events and in times of trade fairs the restaurant will also open on weekends. Our menu offers a good variety of regional and international specialties, made from fresh ingredients. 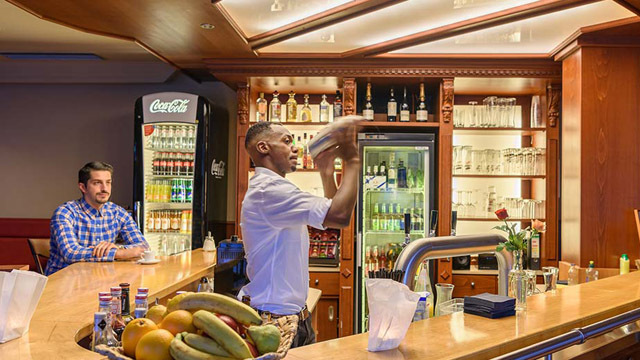 Start or end your dinner with an aperitif or cocktail and enjoy our diverse TV offer, including international soccer from SKY TV. Our restaurant and bar are available for private events, such as birthday parties, company celebrations or regulars’ tables. 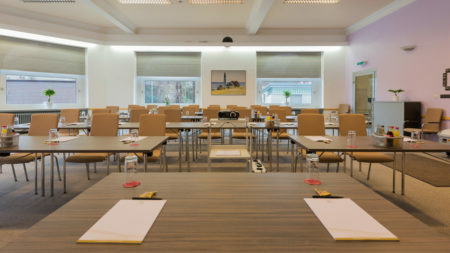 With a capacity for up to 80 persons we would be pleased to be your host! 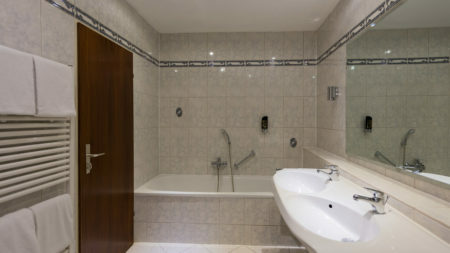 Please contact us to get your personal quote. 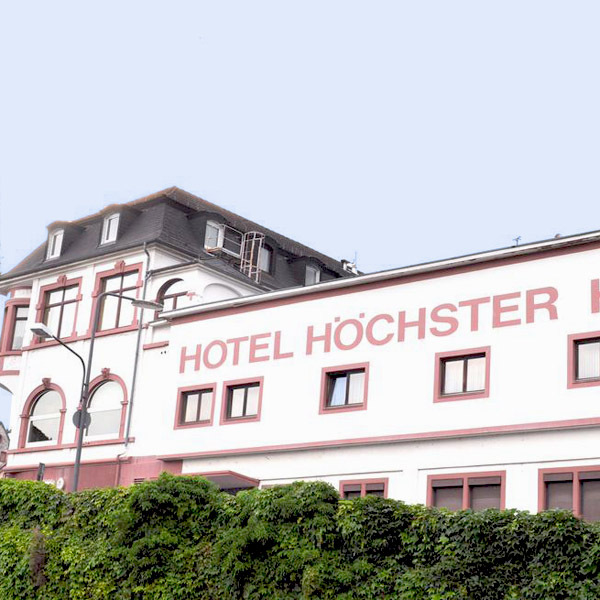 The beautiful location directly at the Main river will make your stay at HOECHSTER HOF a particular experience. 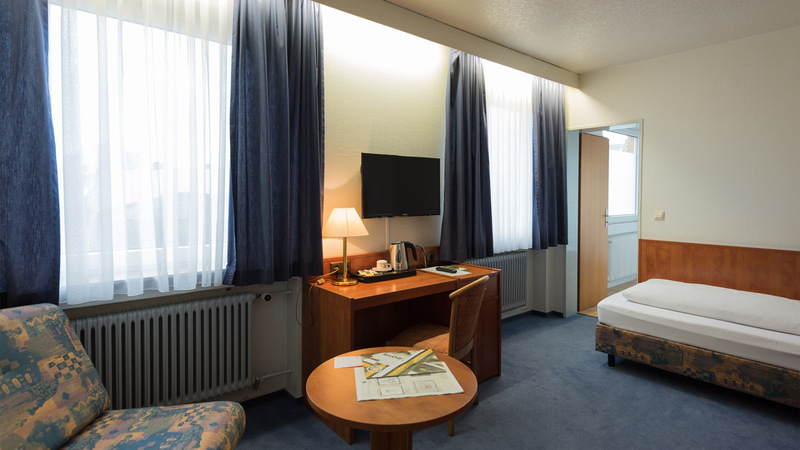 We strive to make your stay as comfortable and enjoyable as possible so you would always like to visit us again. Your satisfaction is our highest goal. Not only the river Main tempts you to have a relaxing walk in the evening. 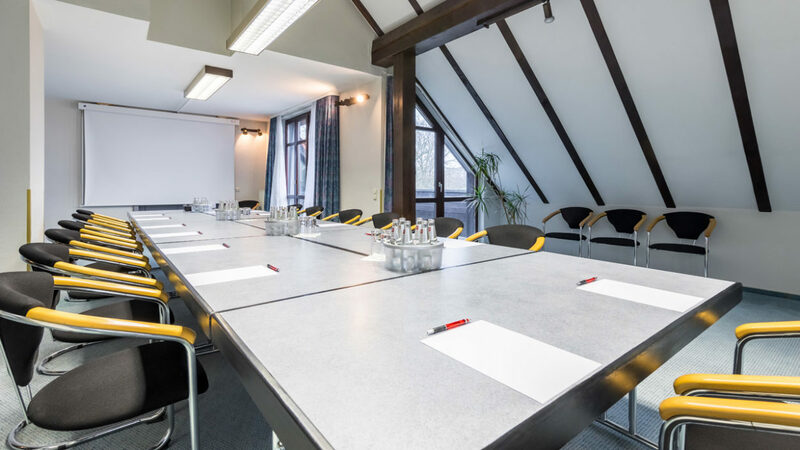 Only a few walking minutes from our hotel the ancient city of Hoechst, the castle and Justinus church and the famous porcellain manufacture are worth to be discovered. 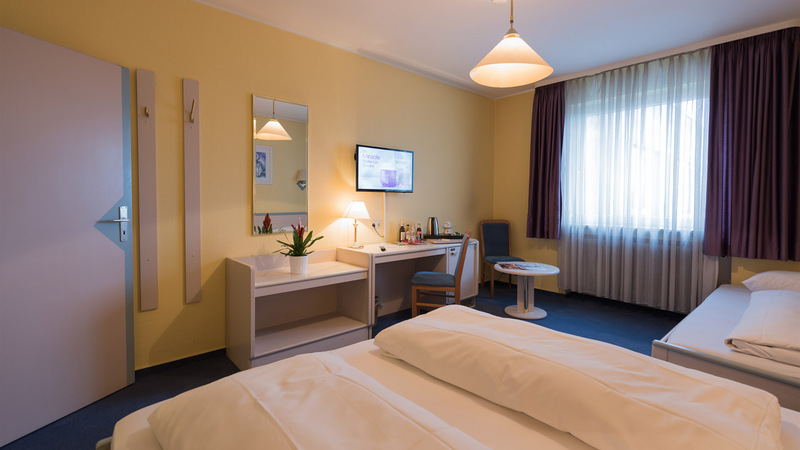 A bit more distant, but easy to achieve by suburban train, you will find the elegant city of Wiesbaden, the capital of Hesse, with its fascinating flair. 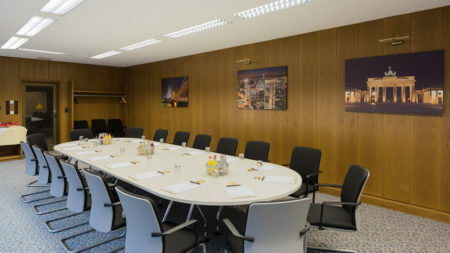 In contrast, the vibrant bank and business capital Frankfurt: the combination of modern skyscrapers and historic buildungs, such as Dom, Roemer, Pauls church or Alte Oper are worth visiting. Messe Frankfurt and stock exchange are the pulsing hearts of this metropolis. 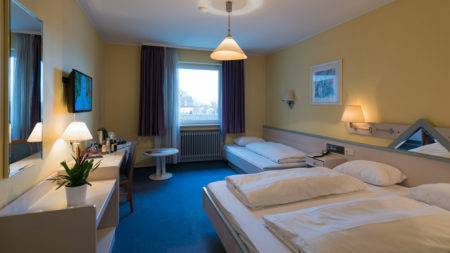 HOECHSTER HOF provides you with 24 own, fee-based parking lots. Additionally, there are about 100 fee-based parking lots available at the river Main. Coming from the A66, take exit 16 „Frankfurt am Main-Höchst“. Follow the Königsteiner Straße until the roundabout. Leave it at the second exit (Hostatostraße) and turn left at the corrsroad Leunastraße. Turn left after the third crossraod Brüningstraße which becomes Bolongarostraße after a while. In about 650 m you can turn to the right and you have reached your destination, Mainberg 3. From Frankfurt Central Station: Take one of the suburban trains (“S-Bahn”) S1 (direction Wiesbaden) or S2 (direction Niedernhausen) on track 103 (undergroudn station). Leave your train at the third station, „Frankfurt – Höchst“. Fromthere get to the bus station in “Leverkuser Straße”, nad take one of the bus lines 50, 54 or 55. Leave the bus at the second station „Mainberg“. Our hotel’s address is Mainberg 3. 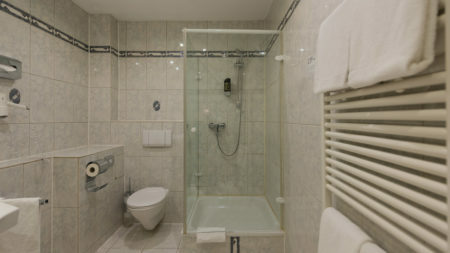 You can also walk from the station Frankfurt-Höchst to the hotel in just ten minutes. Take the Justinuskirchstraße and turn left to the Kronengasse. In a few minutes you have reached the Bolongarostraße. Turn left until “Mainberg” crosses the street. From Frankfurt Airport: At the airport’s regional train station, take one of the suburban trains S8 or S9 in direction Hanau or regional trains in direction Frankfurt Central Station. Get out at Frankfurt Central Station and follow the instructions above (from Frankfurt Central Station). Alternatively you can take the bus line 58 at terminal 1 which takes you in about 25 minutes to the train station Frankfurt-Höchst. From Frankfurt Messe to the hotel: Take the suburban train (“S-Bahn”) S3, S4 (in direction Darmstadt), S5 oder S6 (direction Frankfurt Süd) to Frankfurt Central Station. Get out at Frankfurt Central Station and follow the instructions above (from Frankfurt Central Station).